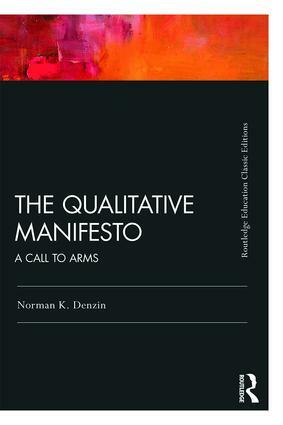 Now issued as part of the Routledge Education Classic Edition series, The Qualitative Manifesto provides a "call to arms" for researchers from the leading figure in the qualitative research community, Norman Denzin. Denzin asks for a research tradition engaged in social justice, sensitive to identity and indigenous concerns, brave to risk presentation in forms beyond traditional academic writing, and committed to teaching this to their students and colleagues. A new preface text by the author reflects on the changes in research, society and in social justice since the publication of the original edition. Denzin looks to the past, present and future of the field, underlining the continuing importance of this brief, provocative book. Acknowledgments. Preface to the Classic Edition. Introduction. 1. A Global Community and the Sociological Imagination. 2. Critics and Bricoleurs. 3. Back to the Future. 4. Pedagogical Practices: Teaching Qualitative Inquiry. 5. Ethical Disclosure, or, in the Forest, but Lost in the Trees, or, a One-Act Play with Many Endings. 6. Reading, Writing, and Publishing the Experimental Text. 7. Templates for Social Justice Inquiry. 8. Coda: A Call to Arms. Appendix 1. A Teaching Template. Appendix 2. An Ethical Code for Qualitative Researchers. Norman K. Denzin is Distinguished Emeritus Research Professor of Communications at the University of Illinois, Urbana-Champaign, USA. He is the author, co-author, or co-editor of over 50 books and 200 professional articles and chapters. He is the past President of The Midwest Sociological Society, and the Society for the Study of Symbolic Interaction. He is founding President of the International Association of Qualitative Inquiry (2005–), and Director of the International Center of Qualitative Inquiry (2005–). He is past editor of The Sociological Quarterly, founding co-editor of Qualitative Inquiry, and founding editor of Cultural Studies–Critical Methodologies, International Review of Qualitative Research, and Studies in Symbolic Interaction: A Research Annual. The Routledge Education Classic Editions Series celebrates Routledge's commitment to excellence in scholarship, teaching and learning within the field of education. Written by experts, these books are recognized as timeless classics covering a range of important issues, and continue to be recommended as key reading for education students and professionals in the area. With a new introduction that explores what has changed since the books were first published, where the field might go from here and why these books are as relevant now as ever, the series presents key ideas to a new generation.